You can remove contacts from a specific group if they are no longer matching the purpose of the group. The contact will stay inside your Contacts. 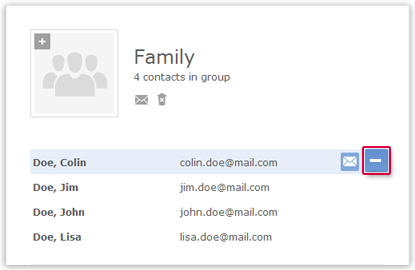 If a contact no longer matches a group, you can remove it from the group. The contact itself is not deleted, it is just no longer a member of the group in question. The group view (on the right) shows a list of the group members. Hover over the group member you want to delete. A minus sign (-) is displayed to the right of the entry.